Paul the Magic Clown performing at camp last summer. Swimming: This year, IPS will be using Penguin City Swim School for instructional swim in our Dolphins (4s) group. Children in our Dolphins group will attend swim lessons twice a week. 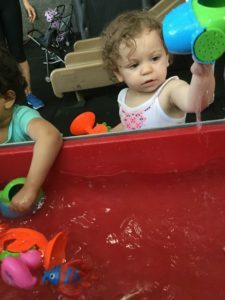 Full Day Goldfish: Our 76th Street and 86th Street locations will offer a full-day Goldfish program (for children entering the Green Rooms at IPS in 2019-20) as well as a full-day Dolphins program (for children entering our Pre-Kindergarten and Junior Kindergarten classrooms in 2019-20). WestSide Hoops: Basketball will be offered as one of two sports for summer camp this year! Our Dolphins (4s) and Goldfish (3s) will participate in basketball. Children of all ages will take part in water play, including sprinklers and water tables. 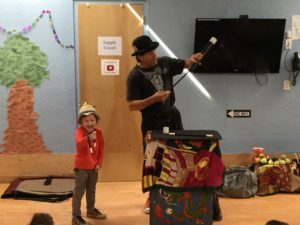 Special Performances: Well-loved performers such as Paul the Magic Clown, Lou Del Bianco the Story Teller, and Spellbound Theatre will return to IPS in summer 2019, as well as animal-themed shows from the Petland Traveling Pet Show and the Art Farm. Camp Themes and Special Days: This year’s camp themes were well-received in 2018, so they will be returning this summer! Animal Planet will be the theme for weeks 1-3 in June; Go For The Gold! (a sports theme) will be the focus during weeks 4 and 5; and Blast Off to Space Camp! will cover weeks 6 and 7. Special theme days will take place during the corresponding weeks (i.e Teddy Bear Picnic during the Animal Planet theme; SUNglasses Day during the Blast Off to Space Camp! theme. Tennis: The Children’s Athletic Training School, a long-running provider for after school and summer programs, returns for tennis lessons during summer 2019! IPS Teachers: Many of our IPS teachers work some or all of summer camp. For current students, it’s a great way to spend more time with their former teachers and/or get to know their teachers for the upcoming school year. Mr. Doug, our music teacher, will lead our weekly camp sing-alongs as well! IPS Location Directors = Camp Directors: Ms. Alyssa and Ms. Tabbs will both lead summer camp at the 76th Street and 86th Street locations, respectively. 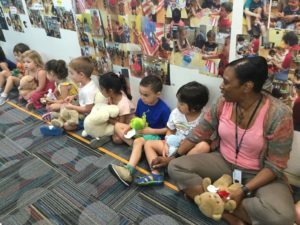 Ms. Tabbs and her 86th Street campers participate in a Teddy Bear Picnic activity! Why Should Your Child Sign Up for Summer Camp at IPS (other than the reasons listed above)? Transitions: Camp provides a relaxed environment for children new to IPS. It’s a great way for incoming IPS students to get used to our school prior to the start of the new year. For children transitioning from half-day to full-day, the easygoing setting allows for students to become accustomed to the longer school day, which in the afternoon provides outlets for increasing self-help skills (i.e. taking out and cleaning up after lunch, setting up rest mats, etc.). Friendships: Current and incoming IPS students will have the opportunity to make new friends and foster old friendships. 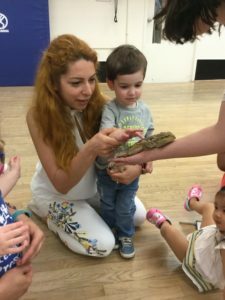 For our Pre-K students, camp provides the chance to be in “class” with peers that will be in different classes in the fall. It’s also a great way for exiting IPS students to spend one last summer in a loving, nurturing, comfortable environment. Interacting with animals during the Petland Traveling Pet Show. Gross Motor Activities: Let’s get moving! Half-day campers will receive one hour each day of indoor/outdoor play, depending upon the weather. Full-day campers will receive two hours of free play; one in the morning and one in the afternoon. Sensory Activities and Water Play: Our oldest campers, the Dolphins, will take part in swim lessons twice a week off-site. All campers of all ages will engage in a variety of sensory-stimulating activities, from sand tables to water tables to sprinkler time! Flexible Schedules: Camp is being offered for seven weeks this summer. You can choose to sign your child(ren) up for one, two, or more weeks. The best part is, the weeks do not have to be consecutive; you can sign up for whichever weeks fit your summer schedule. It’s a win-win! 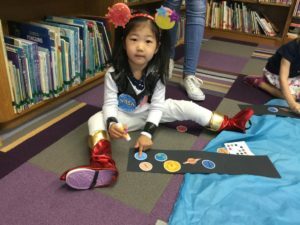 All dressed up for Moon Mission Day during our Blast Off to Space Camp theme! 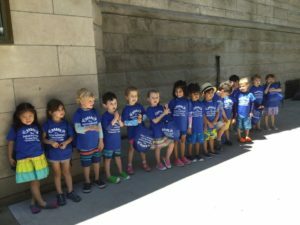 How Can I Sign My Child(ren) Up For IPS Summer Camp? Call IPS Summer Camp Coordinator, Shelby Talbert, at 212-371-8604 x1116 or email her at stalbert@ipsnyc.org. We hope you will join us this summer!